A 3v0 shooting drill this week. 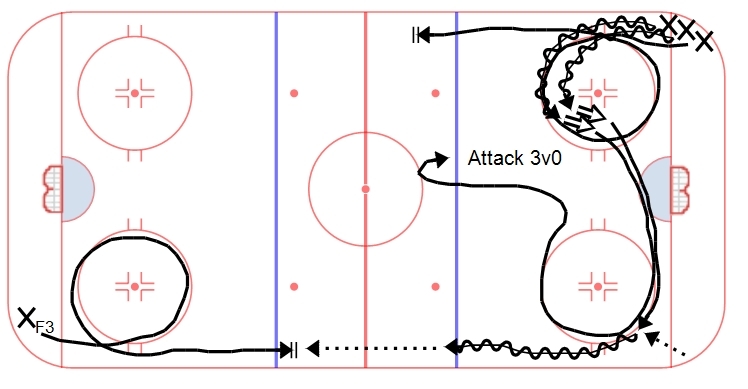 This drill simulates a quick counter attack from your forwards. Emphasize quick transition once all three are onside and a quick decision to attack the net. Transition goals are scored within 3-7 seconds of a turnover, so the quick strike mentality is key. The drill starts with three players in opposite corners. X1 goes around the circle and takes a shot. X2 delays and follows with a second shot. X3 completes a full lap around the circle and posts up inside the near blue line. After the first shot, X1 skates around the far circle and finds a supporting space in the neutral zone. X2 picks up a puck from the corner and skates towards the blue line, making a pass to X3 from the opposite side. X2 then jumps onside and the three X’s quick attack 3v0.